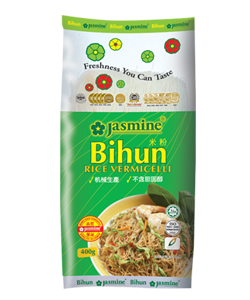 Rice Vermicelli | Jasmine Food Corporation Sdn. Bhd. Bee hoon is a by-product of the milling processes. After sorting, the leftovers of the rice (broken or small grains) are then grounded, extruded and steam-dried to form rice vermicelli. The process is all handled through machinery for hygiene. 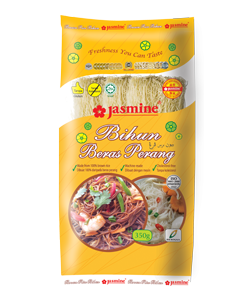 Jasmine Food Corporation Sdn Bhd (162356-H) Lot 5, Jalan Sejahtera 25/124, Seksyen 25, 40000 Shah Alam, Selangor D.E., Malaysia. Tel: 603-5122 3188 | Fax: 603-5122 3288 | Toll-free: 1800 229 888 © 2016 Jasmine Food Corporation Sdn Bhd · All Rights Reserved.